PiiAF has been produced to help researchers assess the impacts of involving members of the public in their research in diverse fields from health care to local history. How are the public involved in research? Examples include helping decide which research should be done and how it is done; collecting and analysing data and developing research instruments. PiiAF is aimed at researchers but members of the public interested in getting involved in research may also find it useful and some people have used it in training for researchers and the public. Why do researchers need this? 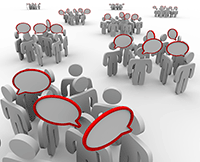 Most major funders in health research now require applicants to involve members of the public. The guidance is designed to be used at the time research ideas and funding proposals are being developed. The PiiAF Study Group includes academics, public involvement facilitators from NIHR Research Networks and members of the public, supported by a grant from the UK Medical Research Council. The Guidance Document and Executive Summary can be downloaded using the link on the right of this page.